I love egg nog. So much so that I wish I could have it all year ’round. So of course I learned to make my own. And every time I offer it to people, I try to do it in Denholm Elliott’s voice from (my favourite movie of all time — don’t judge) Trading Places. He’s just so emphatic. I know. I don’t know why I showed you that. I just love egg nog that much. So when I found this recipe on Design*Sponge I knew the time had come. THIS WAS IT. So first you start by creating an ice bath. That means either filling your sink with water and ice cubes, or a large bowl that will hold your pot. My sink is terrible at retaining water (not my sink, not my problem), so I opted for a heat-proof bowl. 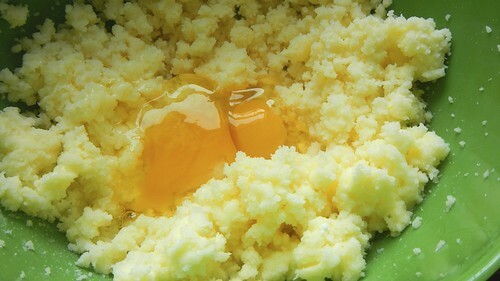 Then grab a medium-sized pot and crack in 6 whole eggs. 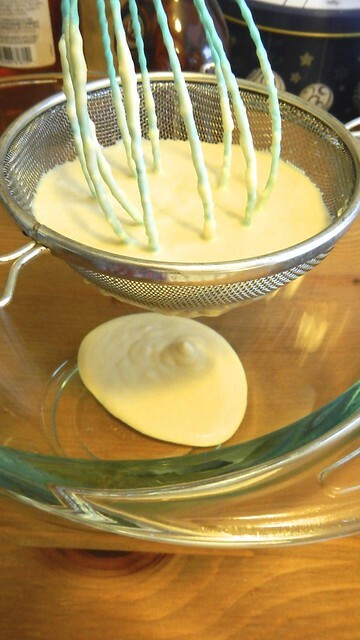 Give those a thorough whisking. 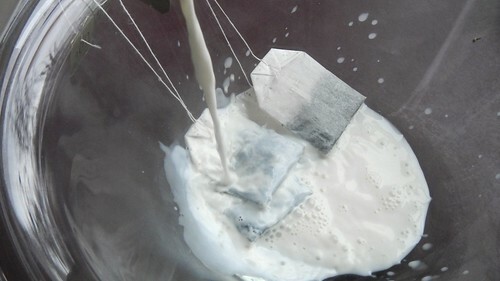 Pour in as well 2 cups whole milk (we call it homogenized here in the Great White North), 1 cup heavy (whipping) cream, and 1/2 cup granulated sugar. 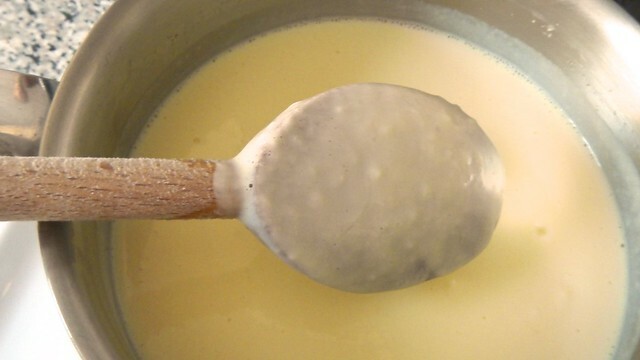 Cook over medium heat, stirring often, until the custard (because that’s what it is) thickens and coats the back of a wooden spoon. Resist the urge to speed things up by turning up the heat. 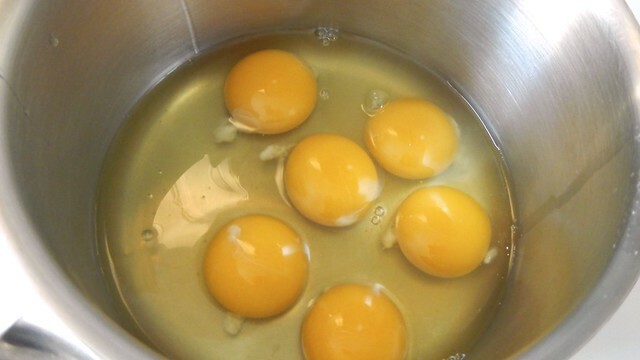 That’s how you get scrambled eggs plus milk. Not cool. Plop the pot into the ice bath. 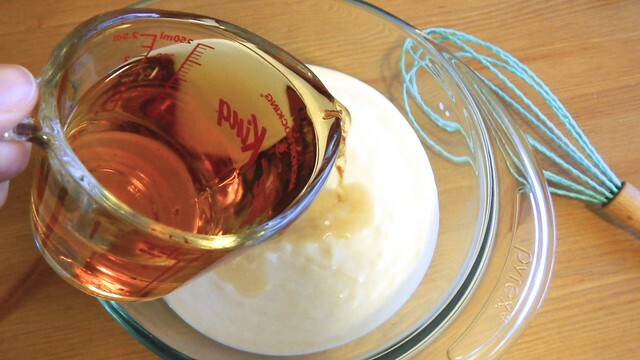 Add in 2 teaspoons vanilla extract and whisk the whole shebang for about 3 or 4 minutes. 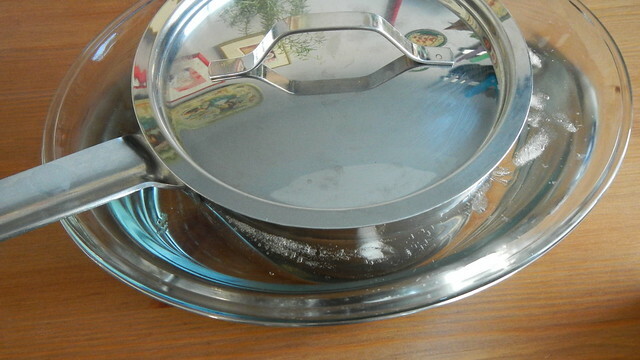 Put the lid on the pot, haul it out of the ice bath, and let it come to room temperature, about an hour (I had some errands to run so I actually put mine in the fridge for about four hours and it was fine as well). 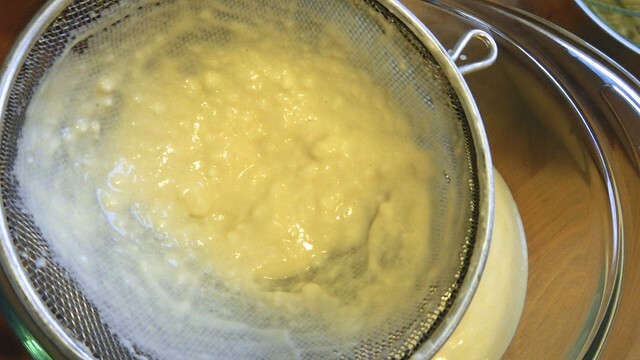 Next, strain the egg solids (those lumpy bits) out of your custard by pouring it through a sieve over a bowl. You can throw these out. Or compost them like a good citizen. Now whisk in your booze***. 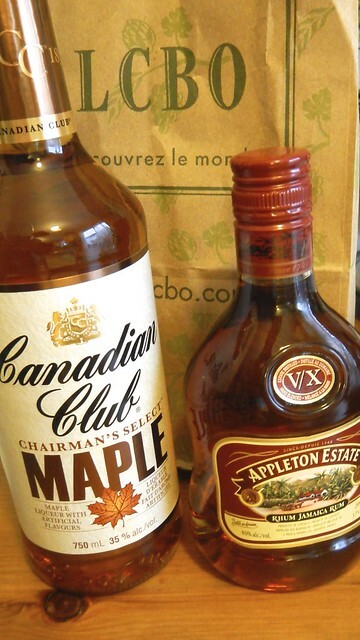 The original recipe calls for brandy or rum plus bourbon, but the Pie and I are not bourbon fanatics like Trav, so we opted for 1/2 cup rum plus 1/2 cup maple whisky. Whisk that whisky right in there. Might as well add a few dashes of grated nutmeg as well. 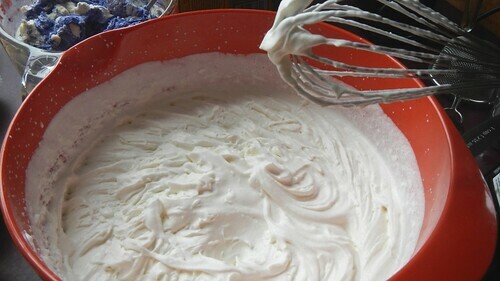 Now pour 1 cup whipping cream into a bowl and beat the crap out of it until it forms stiff peaks. Then fold that gorgeousness into your eggnog. 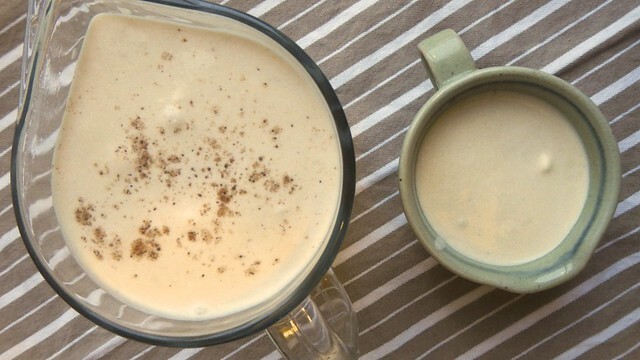 Let your eggnog chill for a couple of hours before drinking. 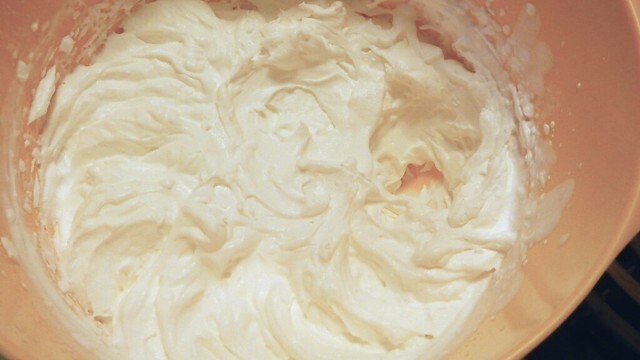 It’s like drinking whipped cream, essentially. I personally don’t think the recipe would be that good without the alcohol to kind of dilute it, so if you’re looking for a non-alcoholic version, this is probably not it. 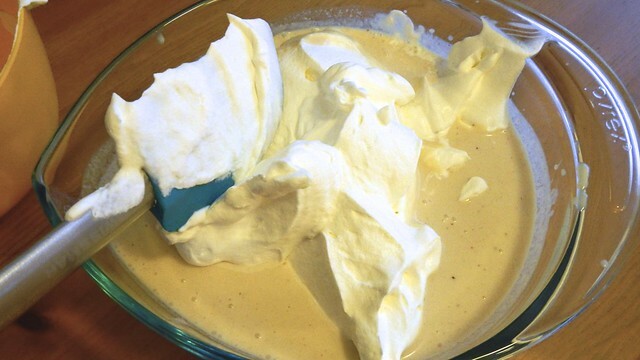 *** That said, however, if you want to try this particular recipe without the booze, this is what I recommend: instead of adding 1 cup booze, add 1 cup whole milk, and then when it gets to the final 1 cup whipping cream, just add it in without whipping. Then the whole thing is much less solid and easier to drink on its own. Author allythebellPosted on 19 December 2014 10 December 2014 Categories Appetizers, Beverages, Desserts, Food, Gluten-Free, Recipes, Sauces, SideBarTags Beverages, bourbon, brandy, custard, egg nog, eggnog, eggs, granulated sugar, ground nutmeg, heavy cream, holiday beverages, homogenized milk, nutmeg, rum, SideBar, sugar, vanilla, vanilla extract, whipping cream, whisky, whole milk9 Comments on Egg Nog? This weekend Mags threw a post-partum baby shower (a “Sip ‘n’ See”) for Ryder and Rusty’s new little one, Rosa. 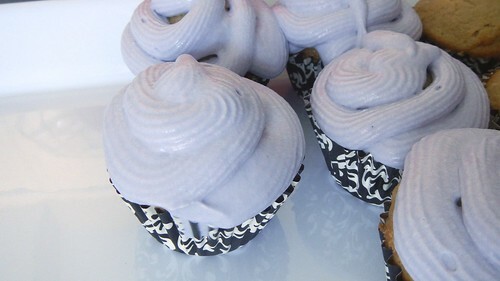 Because the colours of her baby room are gray and purple, I decided to stick to the theme and make Earl Grey cupcakes with lavender icing. Sounds fancy! 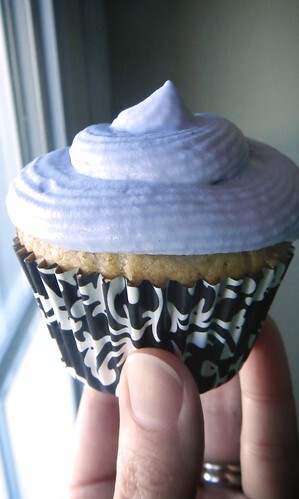 I adapted the Earl Grey cupcake batter from Oh So Very Pretty and chose the Lavender Mascarpone frosting from Kitschy Girl’s Guide and I’m so happy with the results (I made three dozen, so they had better be good!). For both the cupcakes and the frosting, you need a little bit of time beforehand to prep your infusions, so you might want to do them the day before if you’re in a rush. 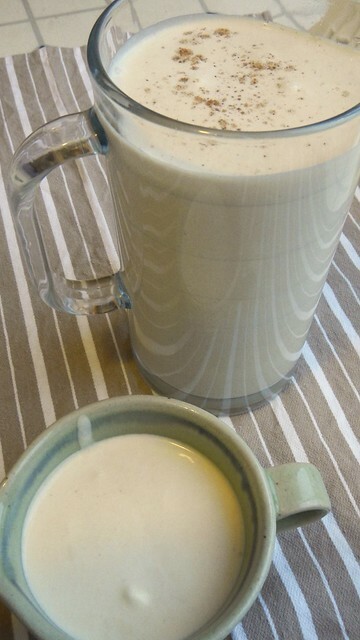 Microwave or gently heat 2/3 cup whole milk for about a minute. 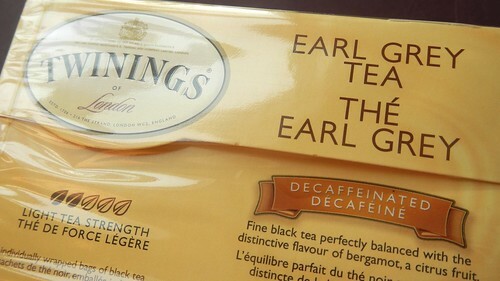 Plop 4 bags Earl Grey tea (or the loose equivalent, if you’ve got it) in the milk and let that steep for 30 minutes. I pretty much just left mine like this until I was done doing everything else, including washing the dishes and walking the dog. So like, an hour. Preheat your oven to 350°F and line a muffin tray with cups. 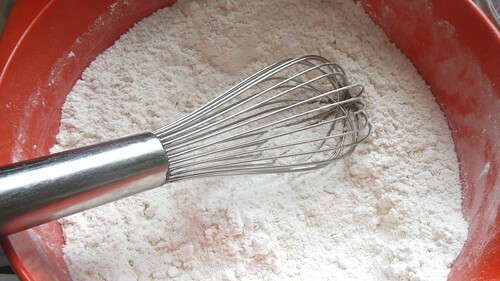 In a bowl, whisk together 1 3/4 cup cake flour, 1 1/2 teaspoons baking powder, and 1/2 teaspoon baking soda. 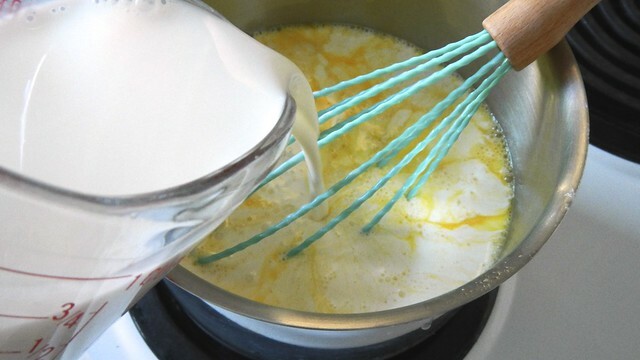 In the bowl of an electric mixer, cream together 3/4 cup granulated sugar and 1/2 cup butter. 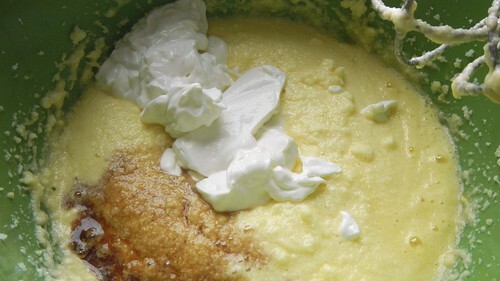 Add in 2 eggs, 1/3 cup sour cream, and 3 tablespoons vanilla. 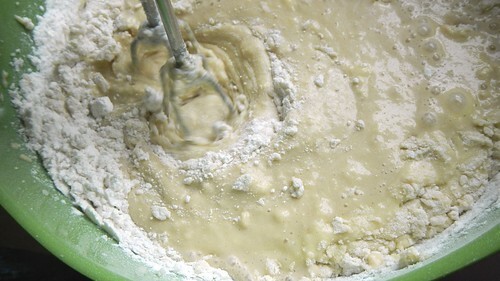 Slowly mix the flour mixture into the liquid, alternating with the steeped milk, until just combined. 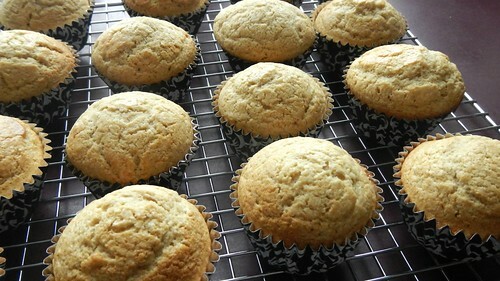 Scoop the batter into your cupcake liners so that they are half to two-thirds full and bake for 15 minutes, or until a toothpick inserted in the centre cupcake comes out clean. 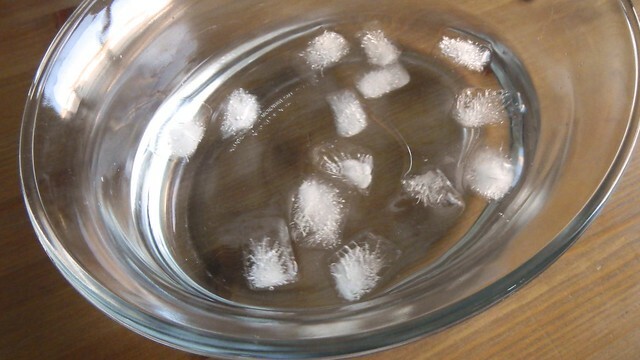 Set them on a wire rack to cool completely. These are puffy cupcakes. Start with the lavender syrup. 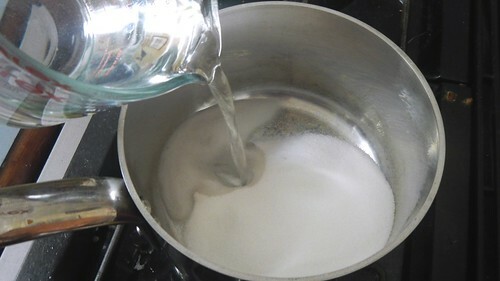 In a small saucepan on medium heat, dissolve 1/4 cup granulated sugar in 1/2 cup water. 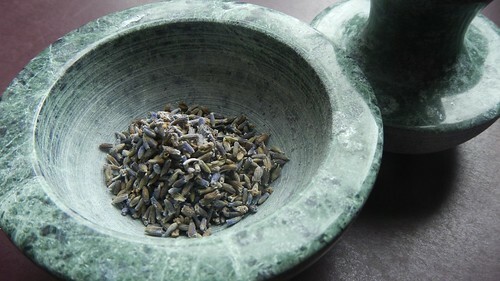 Lightly grind up 2 tablespoons lavender flowers. 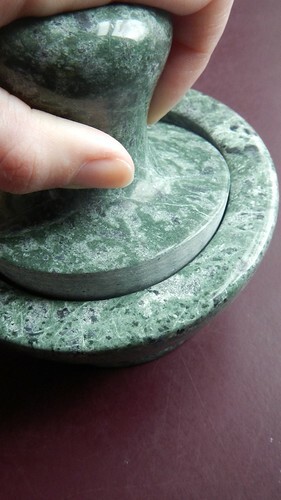 You like my new mortar and pestle? It was a Lee Valley birthday present from Krystopf and Atlas. 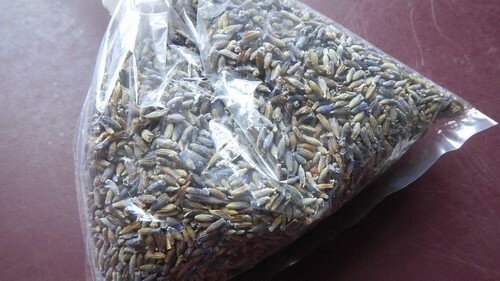 Toss the lavender into the syrup and bring the whole thing to a simmer for about 3 minutes. 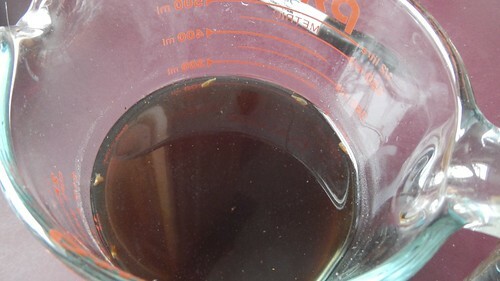 Remove it from the heat and allow it to cool completely before straining out the flower bits. I may have missed a few. In the chilled bowl of an electric mixer (chill your beater, too), start whipping up 1 cup heavy whipping cream and 1 teaspoon vanilla. 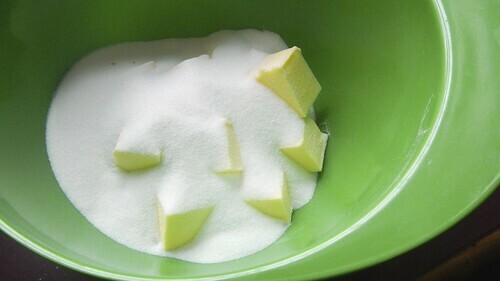 Slowly add 1/2 cup granulated sugar, and keep going until the cream has formed stiff peaks. 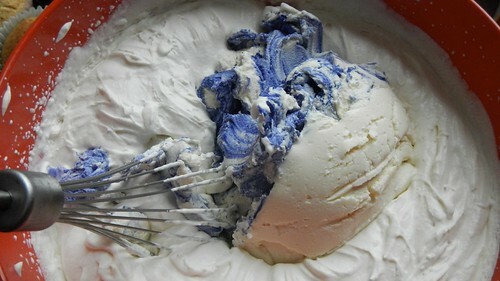 Add in 1 cup room temperature mascarpone and slowly drizzle in your cooled lavender syrup. 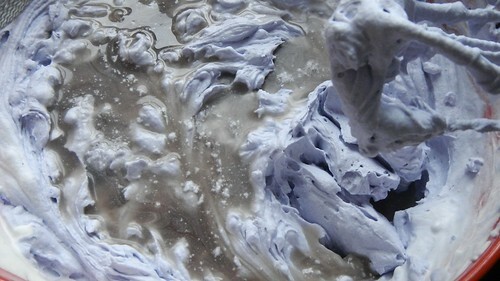 (I mixed in a bit of lavender gel paste food colouring to the mascarpone to give the whole batch of icing a pale purple colour). 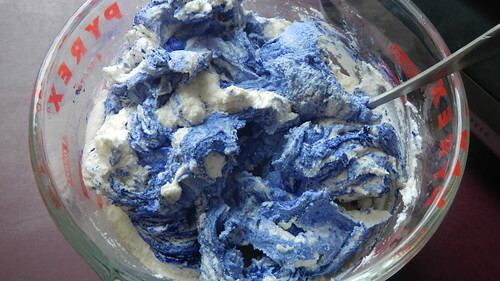 This icing is so luscious and lovely I want to actually rub it into my skin. I don’t know why. 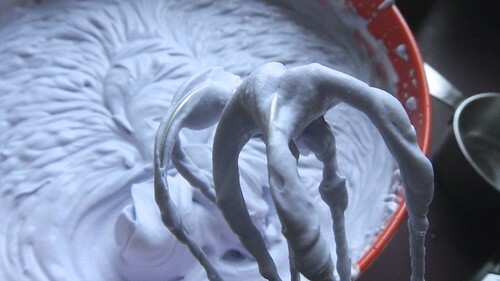 Shove the icing into a piping bag and have at it with your cupcakes. Feel free to sprinkle the tops with crushed lavender or purple sugar or whatever floats your boat. The icing was a little too warm in these shots so it’s a little runny, but as long as it’s cold you’re golden. Happy birthday to both H.G. and Kº! What am I most thankful for this year? Well that’s easy. This week I crashed through the 5000-follower mark here at Ali Does It. And that’s just WordPress followers, mind you: that statistic doesn’t include those of you who have bookmarked the page or signed up for email or RSS updates. Five thousand plus, then. And I’m thankful for each and every one of you. My goal in starting Ali Does It was to show people that doing things like baking a layer cake or fixing a toilet are not too hard to do by yourself (or with some help! ), and that everyone makes mistakes. It’s all a learning process. So. Thanks for being there with me while I do this learning thing. 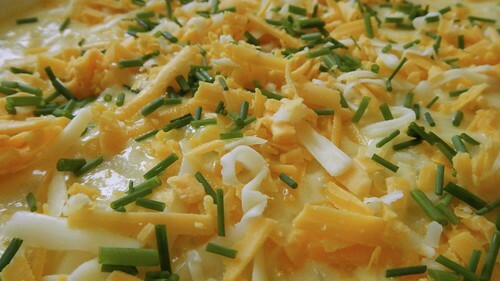 Here’s a nice warm and cozy side dish we cooked up for an early potluck Thanksgiving with the Pie’s extended family. 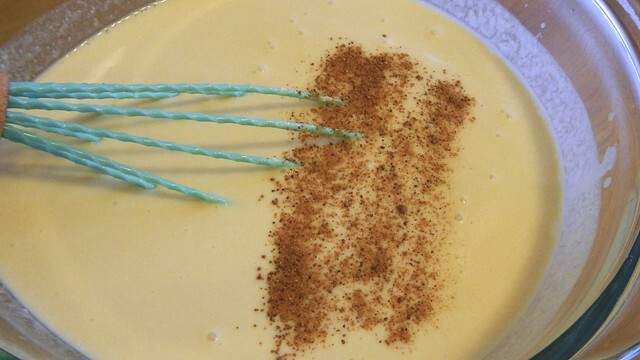 It’s a perfect accompaniment to a less-formal celebration, and a welcome addition to any potluck occasion. Shall we get started? 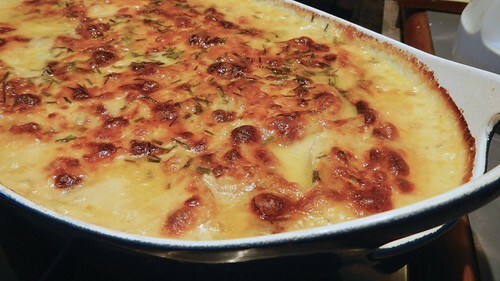 Preheat your oven to 375°F and spray a 9″ x 13″ baking dish (we doubled our recipe and used two oval casseroles instead, but the principle is the same). 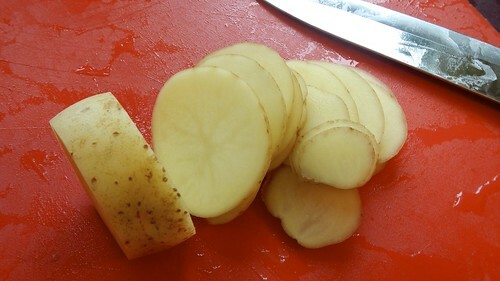 Then turn the potato around and start again from the other end. 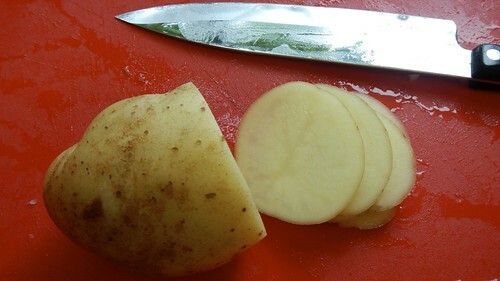 This way you’re not left fumbling with the tiny end bits and a very sharp knife. Brilliant. 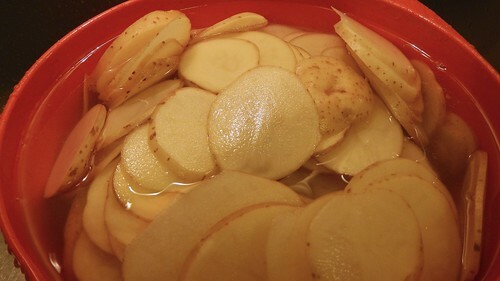 Give the potato slices a good soak for about ten minutes while you do other stuff, just to get rid of all the excess starch. 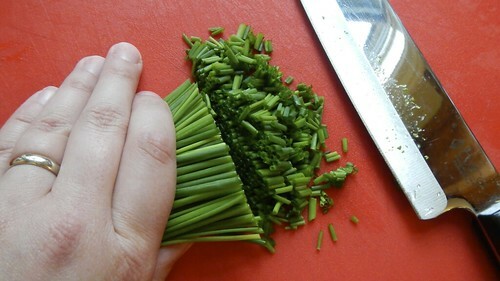 While you’re waiting, grab a hefty handful of chives and chop them up, too. 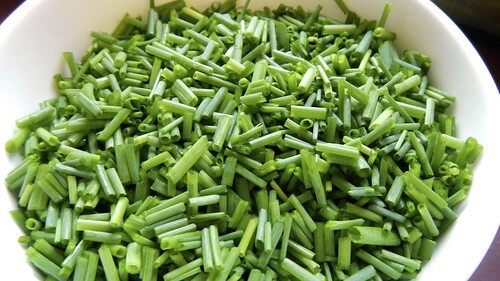 Like, a LOT of chives. 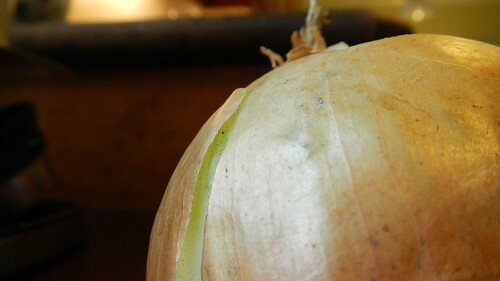 And dice up an onion as well. Set that aside for now. It’s going to be in your sauce. As is the 2 ¼ cups cheese you’re going to shred. We used a combination of Monterey jack and orange cheddar. 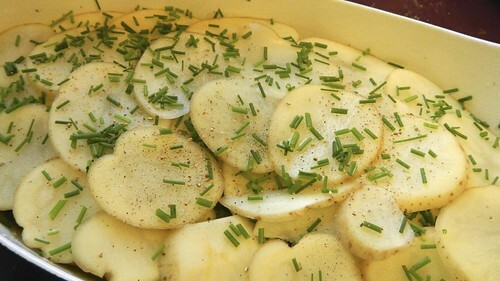 Drain and rinse your potatoes and then start laying them out in single layers in your baking dish. 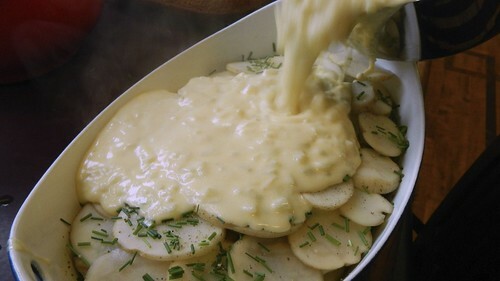 Sprinkle salt and pepper and some chives over each layer and keep going until you’ve run out of potatoes. 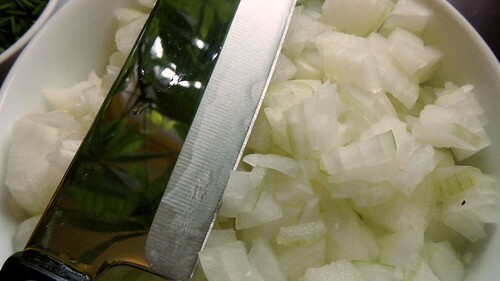 In a medium-sized pot, melt ¼ cup butter and chuck in your diced onion. 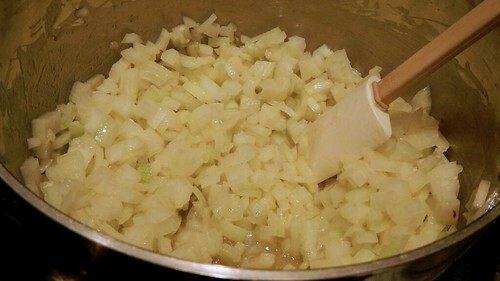 Cook that, stirring, for a few minutes until the onions are soft. 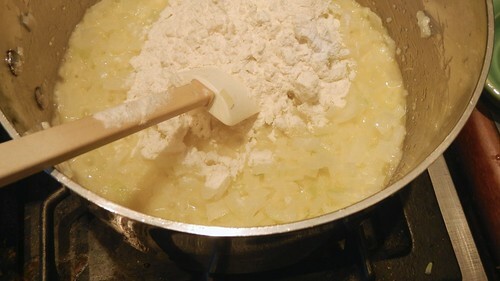 Stir in 2 tablespoons flour, then add 2 cloves minced garlic and 2 cups whole milk. 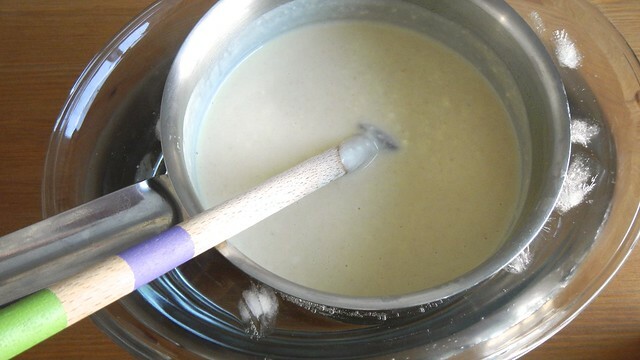 Keep stirring that over medium heat until it becomes bubbly and starts to thicken. 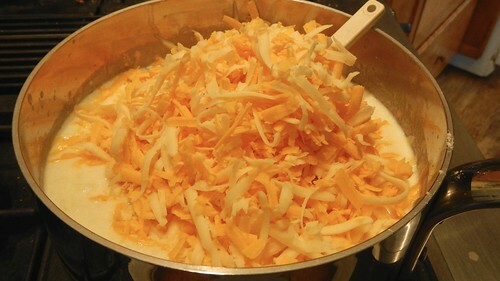 When the sauce is thick, add in 2 cups cheese (save ¼ cup for sprinkling on top) and keep stirring that around until it’s all melted and incorporated into the sauce. 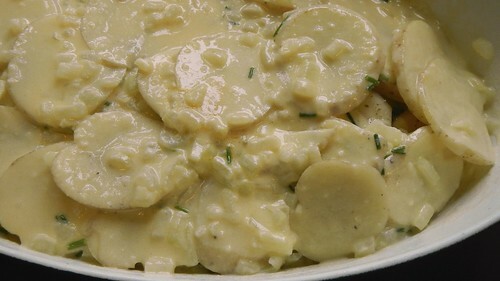 Pour the sauce over the potatoes. 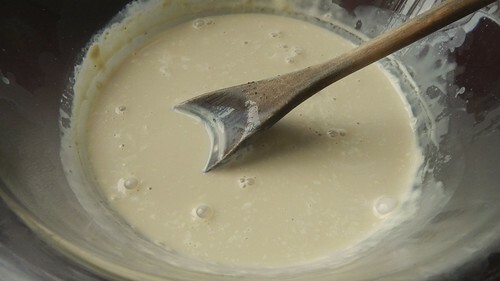 You will likely need to pour about half the sauce, then stop and shake the pan from side to side and around and around to get the sauce to fill in all the little holes. You see all these holes? Then you can use the rest of the sauce. 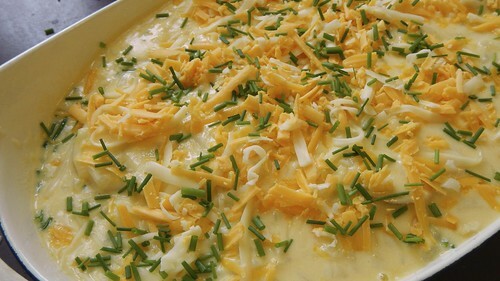 Sprinkle the rest of your cheese and chives on top. Chuck that in the oven and bake for 60 minutes, until the top is brown and crusty and everything is bubbling throughout, even in the centre. Enjoy!